On October 1, 1911, Irwin Kostal was born in Chicago, Illinois. He demonstrated great musical prowess at an early age, and decided not to go to college in favor of studying scores at his local library; he felt he could learn more by himself than not find what he wanted in school. His first paying job was for the NBC radio program Design for Listening, as a staff arranger. He moved to New York where he worked on several shows, including Your Show of Shows, The Gary Moore Show, and later The Julie Andrews Show where he would receive an Emmy nomination. In the 1960s, Kostal found fame on Broadway, working on such shows as West Side Story and A Funny Thing Happened on the Way to the Forum. His work on West Side Story brought him to Hollywood to work on the film version of the show, which in turn led him to work on the classic Disney film Mary Poppins. 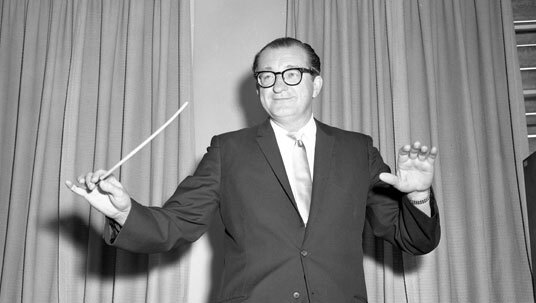 For Disney, Kostal would score several projects, including Bedknobs and Broomsticks, Mickey’s Christmas Carol, and the re-recording for Fantasia in 1982. In his career, he was awarded with two Academy Awards: one for West Side of Story, and one for The Sound of Music. Kostal passed away in 1994 at the age of 83. In 2004, he was named a Disney Legend for his work on composing and orchestrating for Disney. Posted in Uncategorized and tagged Academy Award winning, Births, Composer, Disney Legend, Feature Film, Music. Bookmark the permalink.